Machiya are traditional wooden townhouses found throughout Japan and typified in the historical capital of Kyoto. 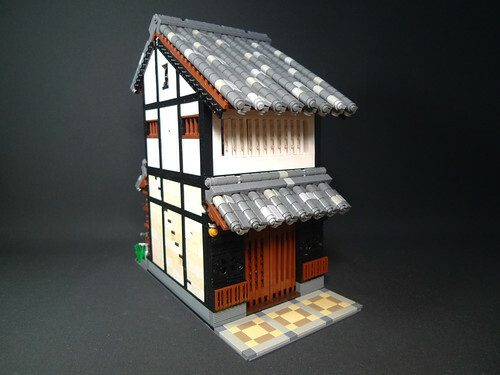 Machiya (townhouses) and nōka (farm dwellings) constitute the two categories of Japanese vernacular architecture known as minka (folk dwellings). Machiya housed urban merchants and craftsmen, a class collectively referred to as chōnin (townspeople). The typical Kyoto machiya is a long wooden home with narrow street frontage, stretching deep into the city block and often containing one or more small courtyard gardens or tsuboniwa. Machiya incorporate earthen walls and baked tile roofs, and could be one, one and a half, two, or occasionally even three stories high. The front of the building traditionally served as the retail or shop space, generally having sliding or folding shutters that opened to facilitate the display of goods and wares. Behind this mise no ma (店の間, “shop space”), the remainder of the main building is divided into the kyoshitsubu (居室部) or “living space,” composed of divided rooms with raised timber floors and tatami mats, and the doma (土間) or tōriniwa (通り庭), an unfloored earthen service space that contained the kitchen and also serves as the passage to the rear of the plot, where storehouses known as kura (倉 or 蔵) are found. 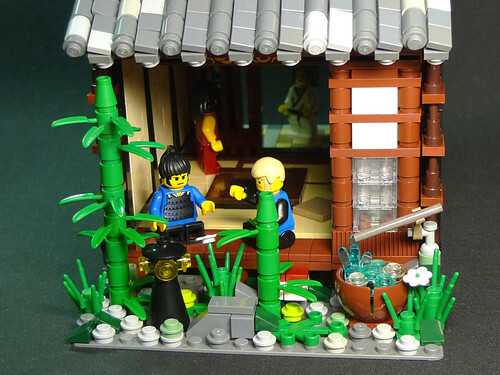 It is very highly detailed both inside and out, and is minifig-scaled. They show how it was built, showing the building taken apart, with plenty of cross-sections and photos of it broken down into its basic components.